"Yes, the Visoflex will fit and work perfectly on the Konica Hexar RF body. 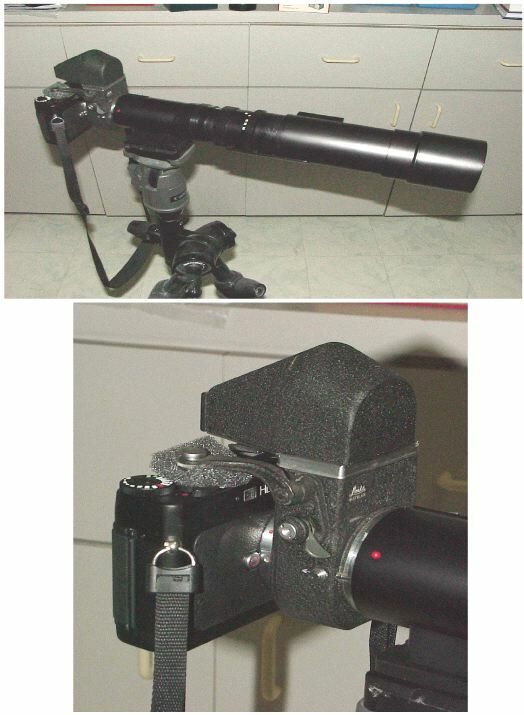 The photos show a 400/6.8 Telyt mounted to the Hexar RF via a Visoflex II (yes, that's right, a II). It was necessary to use a Viso III prism because the Viso II prism will not clear the Hexar's top plate. (This is true for the M6TTL also. You can use a Viso II but you need a Viso III prism). You'll notice a small piece of foam rubber between the Viso release arm and the Hexar's shutter release button. This is because the Viso screw hits the collar around the Hexar's shutter button before it can depress the button far enough to fire the camera. The foam is just enough to prevent this. I'm going to use a smaller piece eventually. When properly adjusted the camera fires smoothly right after the mirror is released, and the Hexar's AE exposure sets the shutter in that instant between the mirror raising and the shutter firing. Of course the Viso II has to be manually reset, so the Viso III would be faster, but since the Hexar winds itself after each shot, I don't mind resetting the mirror. I've never been a big fan of the Viso III, it's just too bulky for me. I can't wait to see the look on the faces of the guys with F5's and EOS 1V's the next time I show up at the race track with my Hexarflex."